Binkabi, an Africa-focused blockchain startup, is set to pilot what it says will be the world’s first commodity exchange on blockchain. The firm will first launch the exchange in Nigeria, having entered a partnership with TAK Agro, a local agricultural conglomerate. But ultimately the goal is to expand, one country at a time, into a pan-African platform. Formed in 2017, Binkabi has to date focused on developing one of its core products, Barter Block, which it is currently implementing with a number of commodity traders in partnership with Ecobank and will be fully launched early next year. Powered by blockchain technology, Barter Block matches trades moving in opposite directions (for example, an export of cashew nuts from Côte d’Ivoire to Vietnam and an export of rice from Vietnam to Côte d’Ivoire) for the purpose of settlement, allowing bilateral trades to be settled in local currencies, thus saving FX costs. Now, in partnering with TAK Agro, the startup is taking the next step towards its vision to empower commodity supply chains to conduct more profitable and fair trade through blockchain technology. The hope is that the new commodity exchange would give producers in poorer emerging countries more power to hedge price risks and better access funding solutions. While many countries in Africa have previously attempted to set up commodity exchanges, “the reality is that most of these exchanges have failed, because of lack of liquidity, but also the cost and lack of a supportive legal system to setting up and running them”, Quan Le, CEO and co-founder of Binkabi, tells GTR. He adds that while 28 countries across Africa currently have commodity exchange initiatives, only two have succeeded: South Africa and Ethiopia. This is a problem blockchain can help solve. The idea behind the new exchange is to lower the entry barrier for people wanting to trade commodities: instead of depending on brokers or paying expensive fees for a spot on the traditional trading floor, the decentralised platform will be a place for anyone, anywhere in the world to trade commodities in the form of digital tokens. How does it work? When a farmer or depositor brings a commodity into a warehouse, a warehouse receipt is issued and converted into a token which can then be traded on the blockchain platform. This is what Binkabi calls the “tokenisation of commodities”. “It makes the commodity tradable instantly, and you can also use the token as collateral to borrow money from a bank,” Le says. “More people can engage in it, and really make the market very liquid.” The pilot will see the tokenisation of 50 to 100 tonnes of four agricultural commodities – rice, maize, sorghum and soybean. These will be traded over a six-week period by 30 to 50 “blockchain enthusiasts” taking part in Binkabi’s ‘emerging traders programme’. As part of the partnership, TAK will provide the physical assets and infrastructure, while Binkabi will provide the technology. Getting banks involved Binkabi’s local banking partners for the project are Sterling Bank and Unity Bank, who will take on the role of clearing banks. While the first pilot will not involve any financing, the intention is that the financial institutions will get involved in this at a later stage. “The banks want to see how it works in practice, to adapt their procedures to lending to this,” says Le. Financing warehouse receipts in the form of digital tokens is something that would draw interest from the banks, explains Edward George, head of Ecobank UK and head of group research. But, he adds, the blockchain-based system will only be successful if it can gain the same level of trust that the current paper-based warehouse receipts have today. “If you do it in a way that banks are comfortable with, absolutely they will finance it, and they would definitely gain so much in terms of managing risk better,” he tells GTR. 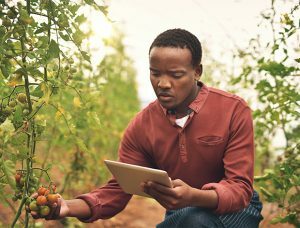 As such, George believes the use of blockchain could be a “breakthrough” to delivering an efficient exchange that will have the potential to “transform agribusiness” on the continent. “Theoretically it’s far superior to the existing system, because blockchain is designed for fragmented information and that’s exactly what a value chain is, particularly for commodities,” he says. “Trade is all about documentation – it has to all be correct before anything can move. The problem is that if there is any kind of dispute, it can often take weeks to assemble all the documentation to assume who said what. Digitally you can do it in seconds. So if you digitise it, you massively speed up the process.” After the pilot, Binkabi will run a number of other tests to refine the design and technology. It is currently obtaining a licence to run the exchange in Nigeria, and will look to start trading in Q1 next year. “Nigeria is encouraging commodity exchanges to be set up,” Le says. “Of course once we begin the paperwork, we will see how it pans out, but it looks like the macro environment in Nigeria is right at the moment.” The plan is then to expand to other countries. The idea, Le explains, is to have a common infrastructure that individual exchanges can easily “plug into”, making it straightforward and cost-effective to set up new exchanges. “We would like to have a common technology, including the same standards for commodities, tokenisation, trading and settlement,” he says. “Another common layer is the liquidity pool. The buyers who are buying cashew nuts from Nigeria would also like to buy cashews from Ghana and Côte d’Ivoire. With every new exchange coming on board, not only do they benefit from the existing liquidity pool, they also contribute to it.” The platform will ultimately integrate with Barter Block. The post World’s first blockchain commodity exchange to transform African agribusiness appeared first on Global Trade Review (GTR).